I’ve got a lot of data. I’ve been been shooting RAW photos for a decade (almost 200 GB at this point), have a large (legit!) music collection (74 GB), and have a lot of other files from various projects over the years I want to hang onto. In total, I’ve got about 330 GB I want to keep. This used to be a very expensive proposition – stuffing it all in Amazon S3 or using backup services that charge by file size was tough to swallow. That landscape has changed recently. 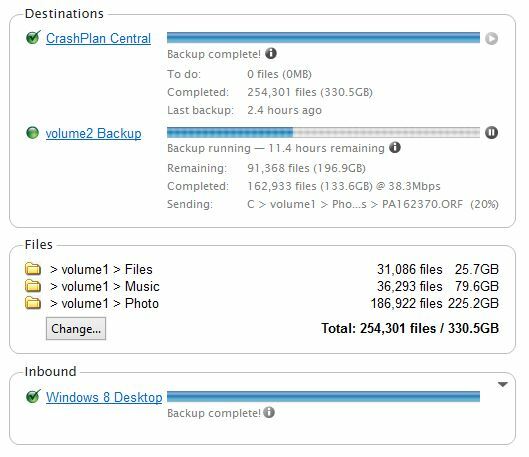 I’ve been using CrashPlan+ Family Unlimited for my home backups for about a year and couldn’t be happier. Unlimited cloud backups for up to 10 computers for $9-14 per month (depending on subscription length) is an amazing deal. 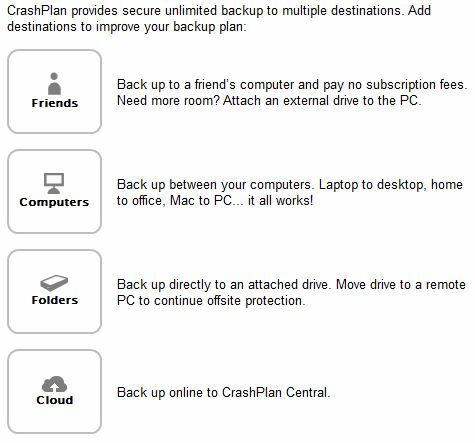 More than being a good deal I’ve also been very impressed with the CrashPlan software as well. It does the typical things you want to see in backup software – good performance, ability to set transfer rates/time of day, data deduplication, compression, and encryption. However it’s hidden strength is its great flexibility for backup targets while maintaining security. In addition to the unlimited cloud storage you can also have local encrypted backups, encrypted backups to another one of your computers running CrashPlan (p2p using the same account), or even send your encrypted backups to a friend (p2p with different CrashPlan accounts). These options create a perfect backup scenario for me – I know I have a local copy of files which I can get at quickly (compared with downloading them all) but they are also stored in the cloud to protect against catastrophic loss (e.g. a house fire). If you find the post at pcloadletter.co.uk hard to follow, Scott Hanselman has a great guide on his site on how to setup CrashPlan on Synology.